Perhaps I just like movies way too much and I’m just easily entertained, but it seems like every movie that I expect to be total garbage has been surprisingly me lately. 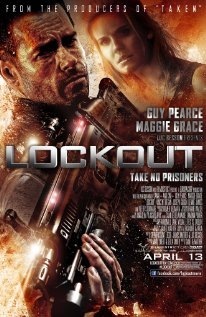 I expected Lockout to be an action movie with nothing but a couple good action scenes yet it turned out to be so much more. Here goes nothing – my Lockout movie review. Firstly, the movie was very clever. The dialogue was very witty and every utterance was a quip. This was definitely the case for Snow (the main character played by Guy Pearce). His careless attitude had him making jokes about every situation he got into. It added a great touch of humour to the movie, although it was somewhat overdone causing his character to be entirely one-dimensional; one of many factors holding my rating to three stars. The second impressive aspect of the movie was its originality. The concept of a prison in space is novel (at least to me) and many of the plot twists were somewhat original as well. Most importantly, the movie veered away from some of the most stereotypical elements. Like the witty dialogue, Lockout may have taken this too far by trying a little too hard to be surprising, but for the most part it worked well. In summary, Lockdown was far more than I expected with its originality, sophistication and originality. Several aspects of the movie held the movie back, including the fact that some of the aspects mentioned above were overdone, however, all-in-all it is a better-than-average action movie. It is worth watching, but waiting to rent it is probably the best move. Next postWhich Browser Do You Use? Chrome, Firefox, Internet Explorer, Safari or Opera?